The question of offering free shipping or not offering free shipping is on e-tailer’s minds year-round. Free shipping has become the norm, especially during the holiday season; 70 percent of shoppers have the expectation of receiving free shipping during the holidays, and 83 percent of consumers search for free shipping when shopping online, according to a study by Arvato. So, how should your e-commerce business approach the growing free shipping frenzy? The simple answer is: very carefully. Today, free delivery promises are on the rise – even during non-holiday months. The growing competition on delivery price, and rising consumer expectations for free shipping, are pushing companies of every size to join the game, driven by the idea that they will quickly fall behind if they don’t. However, if not developed strategically, free shipping offers can significantly decrease margins – an effect that is especially difficult for smaller e-commerce companies that can’t rely on volume to offset losses. With this in mind, below are some key elements to consider when developing your shipping plan during the holiday season and beyond. For most small retailers, a policy of unlimited free shipping all the time is simply not a sound business strategy. It leaves little margin for profit, especially for larger, heavier items with a low price tag (see more on this below). Setting a minimum purchase amount for an order to qualify for free shipping can not only protect your margin, it can motivate consumers to spend more on your site. To set your minimum correctly, make sure you understand the true margin you have on each order, and your overall average order size. Many experts suggest setting your minimum order at a number slightly above your average, in order to encourage additional purchasing. Other free shipping approaches should also be considered, including special promotions, free delivery on select items, free delivery on second purchases (which can boost sales), and free delivery on returns. By using special promotions, such as limited-time free shipping and first-time buyer offers, retailers can test the benefits of free delivery in a contained environment. The nature of the products you sell, including prices, sizes and weights, will all impact the kind of shipping offer that might make sense for your business. Since lighter, smaller items cost less to ship, your cost of shipping (in the free delivery scenario) will represent a smaller amount of your margin, especially for higher priced items. Based on your product offering, you might consider free shipping on only certain items, or you may consider a higher shipping minimum amount if your overall price point is higher. Many e-commerce retailers today are adopting free delivery because they feel pressured to do so, without really understanding exactly what their competition is offering. In other words, just because there is a lot of buzz about free shipping does not mean it is right for your business. It is important to analyze what your closest competitors are doing; their minimum purchase price for free orders may be extremely high, for instance, and some may not offer free shipping at all. If you are in a niche category, competition for your products may be limited, and you may have more room to set your policy. E-commerce businesses, including small retailers, are increasingly moving to take advantage of the huge potential market of global customers. Your shipping offer will differ based on costs associated with shipping domestically versus internationally, and so working with a logistics partner that understands the international market and can provide the best possible prices is key. Regardless of what your policy on free shipping is, experts agree that transparency is critical. Let consumers know up front what their delivery costs are likely to be, and they are more likely to stick with you. With the global digital commerce expected to reaching $6 trillion by 2020, retailers need to act strategically to compete, gain new customers and keep their margins high. Is your business offering discounted shipping this holiday season? 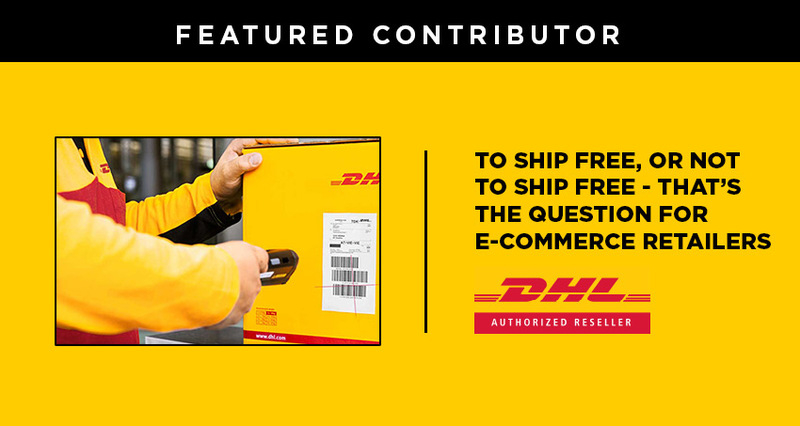 Let us know on Twitter @DHLUS.